Mesothelioma patients and their families eagerly await word of new treatments and continue to hope for a cure for malignant mesothelioma, a cancer caused by asbestos exposure. But right now thanks to the federal government shutdown, one of the major sources for medical scientific discoveries was on hold and losing ground. While we hear a lot about national parks and monuments being affected by locked up national facilities, one of the most dire consequences is the potential impact on research being conducted by the National Institutes of Health (NIH). An agency of the United States Department of Health and Human Services, NIH is the primary agency of the federal government responsible for biomedical and health-related research. 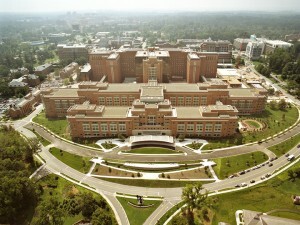 The NIH both conducts its own scientific research and provides major biomedical research funding to non-NIH research facilities. With 1,200 principal investigators and more than 4,000 postdoctoral fellows conducting clinical research, NIH is the largest biomedical research institution on Earth, according to Wikipedia. NIH is responsible for nearly every significant advancement in cancer research and for the discovery of the structure of DNA. Plus the three recent Nobel laureates from the Bay area – two from Stanford and one from Berkeley – owe the success of their scientific achievements to steady predictable NIH funding. NIH actually comprises 27 separate institutes and centers that conduct research in different disciplines of biomedical science. Of utmost importance to mesothelioma patients is the National Cancer Institute (NCI). Federal cutbacks have led to a serious drop in the percentage of grants approved by NIH. The recent government shutdown made matters worse causing the furlough of 13,000 researchers and blocking hundreds of projects, according to media reports. Many experiments are being frozen—in some cases literally—as labs were forced to decide to put many on hold and abandon others. “Whole experiments are beginning to crumble,” said an NIH researcher in an interview with the scientific journal Nature. One scientist at NCI cut off from her lab was unable to complete her cancer study work. She said the tumors on her laboratory rodents had grown so big that they had to be killed without her being able to do tissue biopsies on them. “Discussions of science (at NIH) are overshadowed by doubt, worry and uncertainty,” concluded a dismal report in Scientific American during the depths of the shutdown. Let us hope for all of our sakes that this tragic state of affairs will never be repeated.